Okonomiyaki, a signature dish here in the Hiroshima area, is a savory pancake-like dish that includes a variety of ingredients like cabbage, onions, and meat or seafood. Warning: the "pancake" translation is a misleading one for most Westerners. It's nothing like the sweet breakfast treat that comes to mind. It's cooked on the griddle in front of you, always made to order, and watching the chefs at work is half the fun. First a thin layer of batter is poured on the grill, then an inordinate amount of shredded cabbage is piled on top, follow that with green onions, bacon, a scrambled egg, mayonnaise, seaweed flakes (aonori), bonito flakes (katsuobushi), and, if you're in Hiroshima, oysters. The final ingredient is the all-important sauce. The best is of course made by Otafuku, the client for this informative brochure about this special Japanese dish. As it turns out, drawing people eating okonomiyaki is about as challenging as trying to explain the dish! Japanese people often eat okonomiyaki with a utensil called a hera, a small flat metal spatula. But since I've never actually used a hera, I was unfamiliar with the proper way to eat with one... so it took me a few (felt like hundreds!) drafts to get the hand position just right. I don't typically draw a lot of people, so this was a fun challenge to push myself out of my comfort zone and I'm pleased with the results! The brochure outlines how okonomiyaki and related dishes, like monjayaki, yakisoba, and takoyaki, are made. Otafuku makes several types of sauces for all those various dishes. 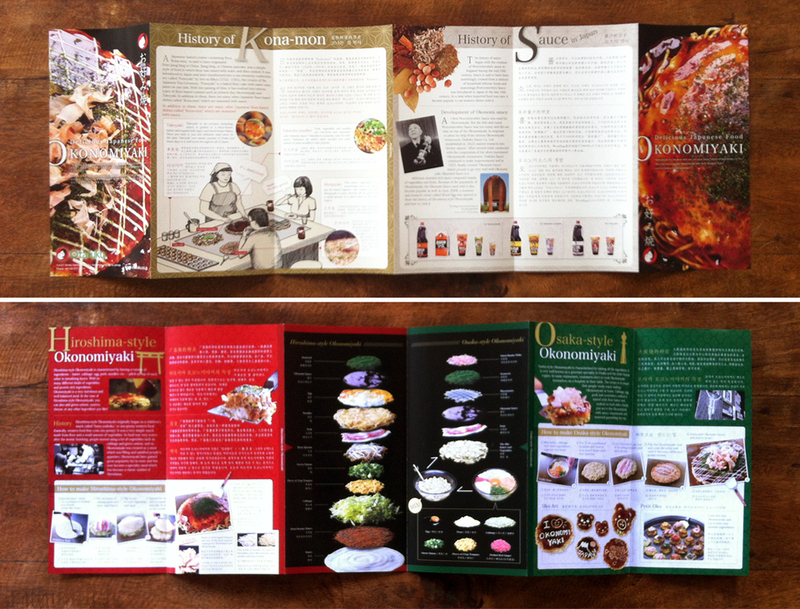 The brochure also highlights the distinct differences between the Hiroshima and Osaka styles of the dish. It's printed in English, Chinese, and Korean. Thank you to the awesome graphic designers at NININBAORI for including me in this project!